Teaming up with esteemed visual artist Rebecca Hendin, GET CAPE. WEAR CAPE. FLY. is delighted to present an innovative new animated video for latest single: ‘Animate’. 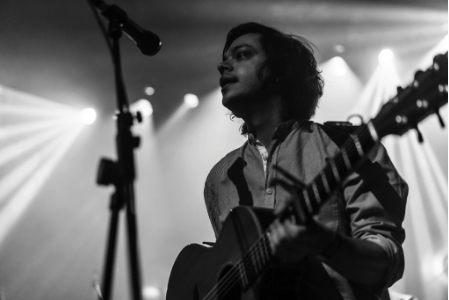 The news comes as Sam Duckworth announces a string of live shows this Autumn with a full live band in tow. A special collaboration with World Illustration Awards winning and currently 2018 Creativepool awards shortlisted artist Rebecca Hendin, the ‘Animate’ Video takes us into a hybrid world where the natural and technological fiercely collide and compete for your attention. “Animate is a song about taking a step back, drinking in the view. In a world of rushing around sometimes the long way is the best way. More peaceful, more beautiful, less rushed. I’m a huge fan of animation, the attention to detail and the endeavour of the human hand. It allows new worlds to be created and for imaginative takes on the present. The song is called animate because of the belief that sometimes its just best to do it by hand, with time and attention to detail. Rebecca Hendin is one of my favourite illustrators. She did an absolutely incredible job of my Recreations album artwork and I’m absolutely made up that she agreed to do the artwork and video for this single." Washed in a hazy reverb and bejewelled with sequinned synthesiser lines, sonically ‘Animate’ is a mellow, reflective and joyous new single to soundtrack the sleepy awakening of Spring and one of the finest cuts from his ‘Young Adult’ album (out now on Xtra Mile Recordings). In addition to this latest video unveiling, GET CAPE. WEAR CAPE. FLY. is also delighted to announce a slew of new live dates this October as he looks to tour his latest studio album with a full live band. Full dates and details below. After a four year recording hiatus from the moniker, Get Cape. Wear Cape. Fly. returned with his sumptuous new album ‘Young Adult’ in January of 2018 (via the Xtra Mile Recordings imprint). Featuring a string of equally different and individually brilliant singles including “Adults”, “Always”, “Just A Phase”,“DNA”, and ‘VHS Forever’, the album was met with warm reviews, with Louder Than War praising Sam’s skill for “catchy and introspective 3 minute pop songs”, whilst Upset Magazine championed the record something of a “soundtrack to a revolution” (4/5). 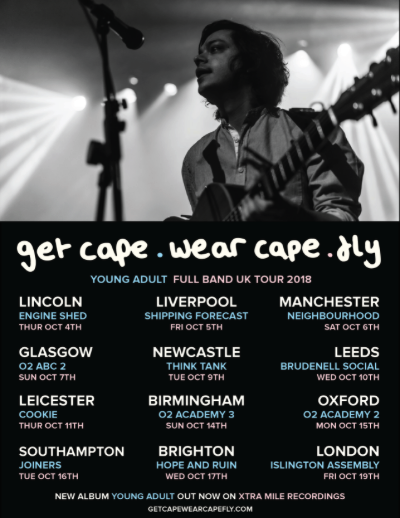 Making his return to the live stage with a triumphant one-off UK show at The Village Underground in London back in January to mark the release of ‘Young Adult’ (a show hailed by The Independent as “a heartfelt and raucous performance” (4/5)), Get Cape. Wear Cape. Fly is well and truly back. Catch Sam and band on tour this October.